After loving my bank for many years—proud of its local ties, excited to be part of its growth from local to regional to national, it’s no fun being a takeover customer of TRACE Bank, a big-box bank notorious for its indifference to the pitiful wails of its little-guy-customers getting screwed. Because of long-term affiliation with my old, no-longer-in-existence-bank, I’ve had free checks since 1989. So when my supply of checks dwindled to reorder status, I took myself to a branch of TRACE near my house. I opened my wallet, pulled out my reorder form, and handed it to the teller. “I need a minimum supply of checks. May I drop off this reorder blank with you?” Fully expecting a simple ‘yes,’ I was surprised at her response. “You’ll need to talk to the accounts rep,” replied the teller. She let herself out from behind the counter and motioned me to follow her. She showed me to a kidney-shaped desk belonging to a very young man (in suit and tie) who stood up and shook my hand. “Our customer, Sara, would like to order some additional checks,” the teller said, as she handed him my reorder blank. I took a deep breath. I phrased my answer carefully. “So far . . . it’s great. But. . . TRACE Bank could change that if I don’t get the answer I want.” I smiled, to show him I was a good hearted old woman, capable of a teasing (but biting) remark. I handed over my driver’s license. Avery clicked and pushed the mouse, squiggled in his swivel chair, drummed his fingers, and clicked again. I could not see the monitor. Finally he broke the silence. “Computer’s slow today.” Eventually the anticipated information unfolded itself to his eyes only. I could feel my blood coming to a simmer. “What? I’ve had free checks since 1989! “No thank you!” I kept my composure. “I like tucking a check into a birthday card—I don’t want it sent separately from some payment center in Salem, Massachusetts. There are some things I need checks for.” I forced a smile. Just then a tall, lean man approached us from the adjacent desk. I think there must have been a customer alarm button under Avery’s desk. The man looked like an undertaker, dressed in a black suit and dark necktie. He made eye contact with Avery who introduced him to me.“This is Pritchard, my manager." He awaited an answer—my “yes”—as if he were a circus barker waiting for the spotlight to light up the trapeze. OK, I was defeated. I nodded weakly. Pritchard scurried to the printer by the window and peeled off a sheet of guidelines for the new account type and four sheets of disclosures. After handing them to me for signatures, both Avery and Pritchard extended their hands, which suddenly seemed stained with the blood of battle. I declined to shake. “Thanks, I’ll await my checks.” I turned to leave. “Don’t forget, you’ll be entered in a drawing each time you make a payment on your Visa!” Pritchard sounded triumphant. I’m sure if I had looked back, I’d have seen them high-fiving each other. Clutching my purse and making sure my wallet was in it, I nearly ran to my car. The fresh air felt good. It had taken me forty-five minutes to accomplish it, but at least I wasn’t paying for checks. Hah! A wild thought crossed my mind. These checks were now so precious, maybe I’d keep them in my free TRACE safety deposit box! Oh, and maybe I's use my free cashiers checks to enclose in birthday cards, and with two a month, I could use cashiers checks for donations to non-profits, as well. Maybe . . . just maybe . . . I could make those 120 “free” checks last for the rest of my life! I felt like high-fiving myself as I drove out of the parking lot. around the spectacular set-piece, nicknamed "The Claw"
and the two bridges to the outer walkway move. Did you hear about the outdoor concert in Minneapolis last Saturday, July 23? Fifty-six thousand attendees (yup, you read that right—56,000) sat (or stood) enthralled, even though the heavens opened up and drenched them for more than two hours straight. Did you hear about the gridlock afterwards? Even attendees who thought they’d outfox traffic by arranging for chauffeured limos to wait outside the stadium spent multiple hours getting home. Did you know the spectacular 167’ tower and stage (the largest set piece ever devised for an outdoor tour) took 200 stagehands and several cranes five days to set up? Did you have any idea that I, Sallie Glerum, was there? Yes I was! 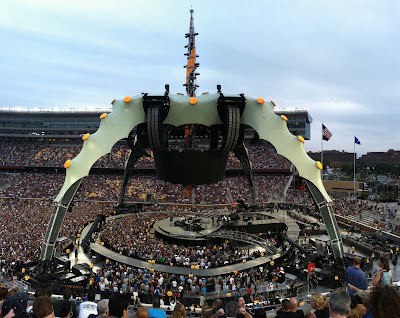 I traveled to Minneapolis to be one of those lucky thousands in attendance at U-2's 360° Tour. This is the U-2 tour that was originally scheduled for 2010, but postponed for one year because lead singer Bono injured his back while preparing for it. This is the concert my youngest son, P., invited me to attend as his guest in celebration of my big SEVEN-OH birthday. Of course, my seventieth was last year . . . but because of Bono’s injury, my gift couldn’t be ‘cashed in’ until I turned seventy-one. And now I can cross that off my bucket list. Yes, it was my first rock concert. . and quite probably my last. We knew the weather forecast, so all four of us (P., his wife, his mother, and his sister) carried raincoats, despite the heat and humidity of the evening. We'd read that the concert would NOT be cancelled due to weather, but little did we know that a huge downpour would begin at 9:10 p.m. (ten minutes after the concert began) and not let up until 11:20 p.m., just as U-2 left the stage and the final applause began to peter out. It's probably just as well we didn't foresee how the rain would soak us . . . through raincoats and clothing . . . how even our underwear and socks got wet! Did we care? Not really. Was it too loud? No. I was wearing ear protection, of course, but several times during the course of two and a half hours, I sneaked a “listen” without the protection. It was glorious, actually. Was the music spectacular? Yes. Moving? Absolutely. Isn’t U-2 music always moving? It gets me in the gut. Had I ever before stood willingly in a torrential rainstorm for more than two hours? No. Am I sorry it rained? No. The concert was worth it, and the rain made it all the more memorable. And, I’m quite sure relatively few of the thousands left early. Did Bono get rained on? Of course! His stars-and-stripes umbrella helped a little, but his hallmark leather jacket and trousers must have been soaked through. How about The Edge? Yes, drenched! Bassist Adam Clayton took off his shirt—one way to solve the problem of being soaked to the skin. Only Larry, the drummer, stayed relatively dry under the ingenious umbrella, part of the stage design. Did Bono acknowledge the rain? Subtly—snippets of Singin’ in the Rain, Purple Rain, and Raindrops Keep Falling appeared inside U-2s repertoire. How long did it take to get back to P.'s house? More than two hours. Did it rain all the way home? No. But it was muddy. We walked a couple miles through construction on campus and city streets toward town (we’d taxied from downtown to the stadium) where we'd parked the car. Eventually, P. ran ahead another mile-plus to get the car, then doubled back to pick us up. Will I ever forget this event? Never! Not unless senility gets the best of me. I cannot thank my son enough for the privilege of this evening. I absolutely loved it. 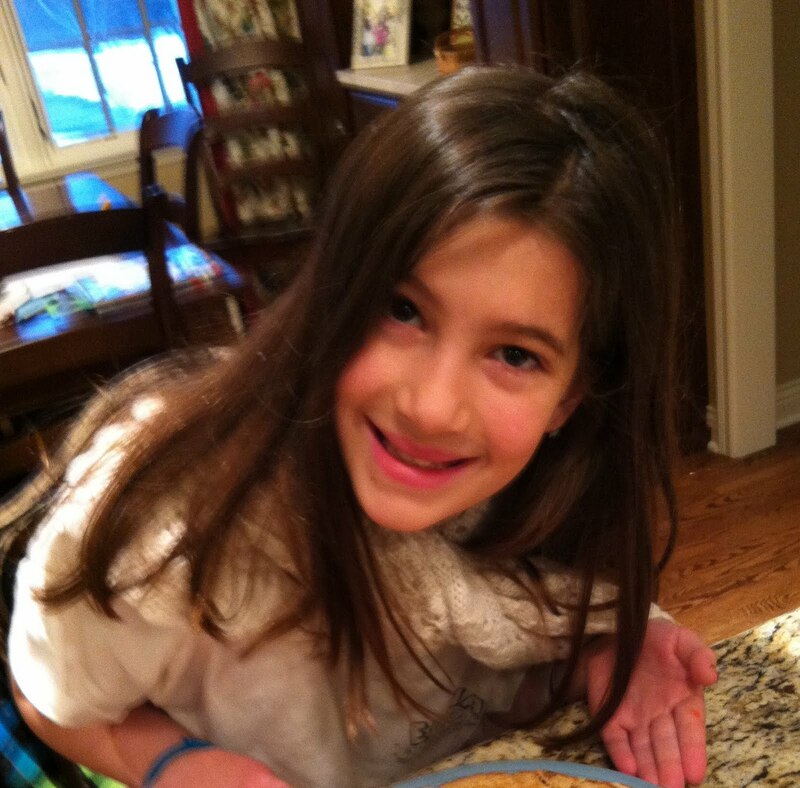 Recently, our eldest granddaughter, Katie, turned ten. Remembering how much of a big deal I thought my tenth birthday was, I wanted to think of a big deal gift for her. 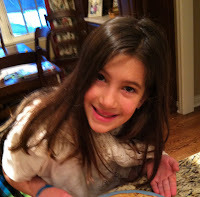 And--if truth be told--it's a big deal for a grandma, too, when her first grandchild is ten. After considerable thought, I bought several small gift cards from stores that Katie likes. I then wrote a card with lots of "ten" words in context with the types of purchases she could make with the cards (heighten, brighten, smarten, enlighten, sweeten, listen, etc.). I packaged the whole thing on a glossy 8 x 11 sheet with her picture on it. Did she like it? This is a direct quote: "Thank you for the "most awesomest present . . . like, ever! And that, my friends, is music to Grandma's ears! I first tasted kale chips just a year ago. One of my kids made them—and so quickly I completely missed the process! 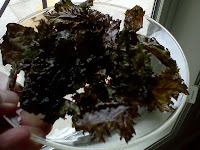 One minute fresh kale was in the salad spinner; a few minutes later, a bowl of kale chips was being passed around the dinner table. Yum! This year, thanks to the generosity of a friend and kale grower, I tried making them myself. They are SO good and SO easy, I offer the recipe—in case you haven’t tried making them. Wash and spin (or pat dry) fresh kale. Separate the leaves from the stems (which are then discarded). Toss in a small amount of olive oil. Spread leaves on a cookie sheet and bake 10-15 minutes at 350°. You’ll know when they are done because they will be small and crisp. Sprinkle with kosher salt (or any kind of salt) as soon as you take them out of the oven. Pinned down . . . looking back. Recently I’ve been going through saved letters for the purpose of disposing of them. A few letters I wrote years ago have been returned to me by friends, and as I’ve reread them, they’ve taken me right back to the year they were written. Some have made my hair stand on end—either for the opinions I held, or the life I was living many years ago. Here is a paragraph from a letter I wrote on Nov. 4, 1970. A milestone has occurred! P. is toilet trained during the day. Except for the one night diaper, I’m out of diapers! Whee! Seven years [of] continual [diapers], and I’m no longer a slave to pins and rubber pants. If you were to ask me how long my children were continually in diapers, I could figure it out—without the letter. But it shocked me when I read it. If we discussed those days, I'd probably remind you that my children were raised before disposable diapers were invented. The introduction of the first mass-produced throw-away diapers, Pampers, was almost simultaneous with P’s entry into the world of underpants. Until the early ‘70s, hospitals sent home a small supply of newborn-sized paper-diapers with their new moms, in case the stork had caught them unprepared. But once the supply of disposables was gone, the wash machine became eligible for an Oscar in its role as the most important appliance in the house. Cloth diapers were indeed a staple at our house—in our family, we actually wore them out! (If they weren’t worn out, they made GREAT dust cloths.) The phrase in the letter, “slave to pins and rubber pants,” startled me in the letter. I’d all but forgotten the hazard of pins. While I don’t remember ever jabbing my babies, I do remember jabbing myself a number of times as I shielded their tender flesh with my fingers. And the rubber pants! They came in two kinds: leaky and not-very-leaky. The best ones were rubber-lined fabric—soft and machine-washable. Eventually the rubber flaked off, which rendered them ineffective, but while they lasted, they kept clothing relatively dry. The worst "rubber" pants started out as supple plastic, but became brittle after a few washings—poking the child in uncomfortable places and, of course, leaking. Personally, I was a devotee of J.C. Penney’s product. Not only did I purchase dozens of pairs over that seven year period, but touted their superiority to anyone who was interested. If this were July 1970, I’d have to stop writing now to put a load of wash in—and since it’s sunny and warm today, I’d be hanging a dozen diapers outside to dry. But it’s July 2011, and I’m going to have a second cup of coffee and read the newspaper on the deck. I feel no nostalgia for that part of my past.